Today we’re pleased to announce a design refresh of GSMArena.com and our revamped brand image including a new logo. This is the first serious remodeling of our brand logo since the launch of the website more than ten years ago so believe us, it wasn’t easy coming up with a new one that reflects our website’s theme and personality. 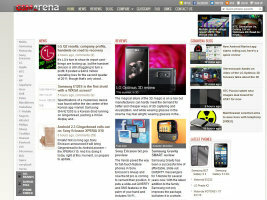 Our goal with the redesign and the new logo was to make GSMArena.com look more modern. We took extra care not to hinder the website’s usability and we didn’t swap bits and pieces around either so everything’s laid out just the way you are used to. Our second (but equally important) goal was to optimize the website for faster loading times. We dug deep and we used various optimization techniques. We are happy to report the new version of the homepage is snappier than before even though now it hosts more images. So we’ve done a lot of work on the back-end too, it’s not the same old face hiding behind some new makeup. Finally, we’ve made it easier for you to manage your logon process in our comments section. The Log In button in the top right corner will easily allow you to log in and will also serve as a quick visual clue as to whether you’re logged in or not. You will notice we’ve also increased the focus on the reviews and the news stories on our front page, but you can rest assured we’re still as dedicated as before on maintaining and developing our industry-leading phone database and phone search tools. Besides searching for phones by default, our new Unified search box now offers a drop-down choice to perform a free search in our news or reviews section. A link to our mighty Advanced phone finder is found in this drop-down menu as well. 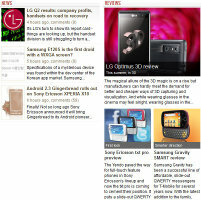 Since its start-up, GSMArena.com has been at the forefront of the mobile phones technology and our new redesign supports our image of modern tech media, a one-stop shop for your mobile phone research. 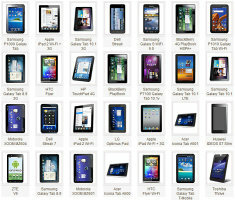 The brand update closely follows the inclusion of tablets and CDMA phones in our specs database and reviewing routine, so you will be getting an even more varied wealth of content than before. Speaking of which, for many of you our blog is quickly becoming a center point for getting timely updates about other tech news, software reviews and stuff from the GSMArena’s kitchen. The whole blogging thing has grown on us too and preparing stuff for it has now become part of our company culture. You can bet we’ll be putting even more effort into writing for it. The new redesign takes into account the increasing importance of our blog as a means of communication with you and starting today the latest blog headlines will be even more noticeable on our homepage listed with image thumbnails. We really hope you’ll be enjoying the stuff we do there as much as you enjoy our regular news and reviews articles. The website redesign doesn’t bring much new functionality per se - it’s more of an aesthetics update than an introduction of new features. Nevertheless, you know we’re always working on new stuff for you, so the future definitely holds more intriguing changes. Our next project is to bring our blog up to speed with the new design language and the new brand identity and we’re also hard at work on a proper mobile website that should make browsing GSMArena.com on the go that much more appealing. So, we hope you enjoy the whole thing. As usual, drop us your comments in the section below. When reporting any problems or bugs you've encountered, please include your OS and browser version as well. Thank you! Old website was much better.This looks foggy.Anyway, we have to move forward.Now i come to know that, how room is created for competitors by the giants.